Embark on a brand-new career with our latest trading guide! If you are considering making the step into the highly rewarding online trading world, but you’re not sure where to start, our latest trading guide offers the perfect solution. Online trading can be a highly rewarding, stimulating and profitable career choice, and our comprehensive guide introduces beginners, who are keen to learn to trade, to the must-know advice they need to get started. What is online trading? Alongside introducing key financial markets, approaches and the trading software needed to help you get started, we take a dive into day and swing trading. With contrasting styles, characteristics and benefits to traders, we explore these key trading styles and offer an overview of their approaches. From day vs swing trading, learning how to develop your trading strategies, and approaches to online trading, our trading guide encompasses all you need to know if you’re keen to make the first step as a trader and need some advice. Our online trading guide also includes a glossary of trading terms to familiarise you with some of the key language of professional traders that you may encounter in this rewarding industry. With clear and concise first steps explained, you can familiarise yourself with the world of online trading and learn to trade with confidence. Learn to trade and embark on an exciting new career with help from our comprehensive Guide to Trading. 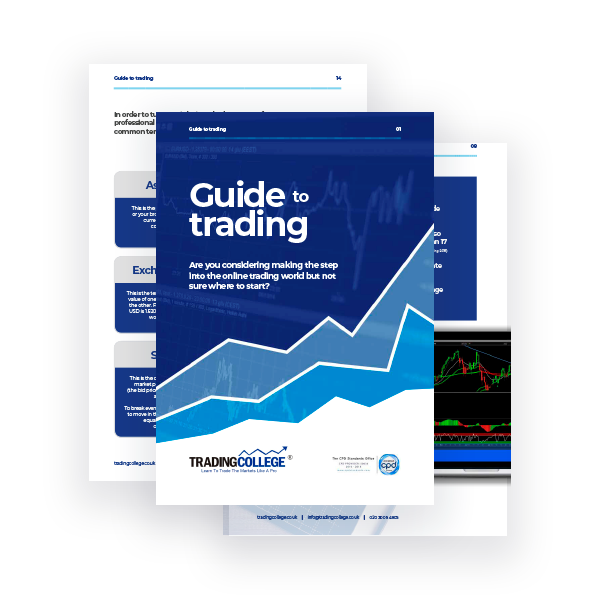 Download Trading College’s Guide to Trading below and take your exciting first step into the online trading world today.